The Calumny of Apelles by Maerten de Vos is about to have its international premiere at the Rubens House. Today, the panel by De Vos is the only known painted version of the theme from the Netherlands. Having spent centuries in private collections, this exceptional work can now be introduced to the general public for the first time at the Rubens House. Apelles, the most famous painter of the Hellenistic Period, was blasphemously accused of conspiracy against the Macedonian General Ptolemy. The latter was about to have Apelles executed when the truth about his innocence came to light and the painter was acquitted at the last minute. The depictions usually show a number of individuals who represent all aspects of the slander or gossip. The King, usually depicted with long, asinine ears, is surrounded by Suspicion, Ignorance, Deceit, Envy, Treason or Repent. The Calumny of Apelles is a theme with which De Vos could present himself as a learned Renaissance artist. The theme was rediscovered in the early 15th century when a text by the Greek philosopher Lucian (125-180) surfaced, in which a lost painting, The Calumny of Apelles, was described. The topic, following its discovery, met with great popularity. Well-known Italian masters, including Andrea Mantegna and Sandro Botticelli, displayed the difficult topic in a masterly fashion. In the Netherlands, since Apelles was considered the personification of the perfect painter, Rubens was repeatedly praised as ‘the Apelles of his time’. While the talented De Vos (1532-1603) is less well-known to the general public, thanks to his masterful, historical paintings, he can be considered the precursor of Rubens. He had a flourishing international career and received numerous major commissions. For his Calumny of Apelles, Maerten de Vos used a famous print of Giorgio Ghisi (1520-1582), which circulated in Antwerp, to work from, but did not copy the print blindly. 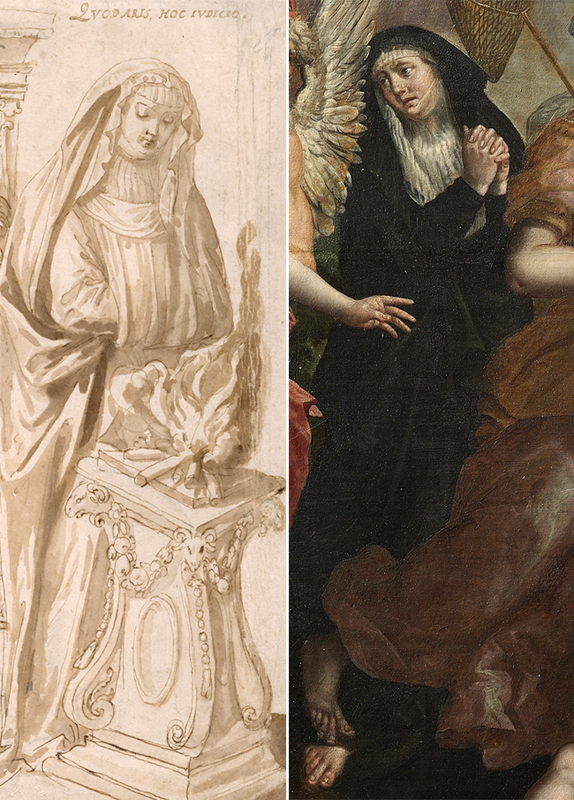 Some of the characters on De Vos’s painting show a strong resemblance with some preliminary drawings which the artist did just before 1594 and which are now kept in the Museum Plantin-Moretus. He may have used these drawings as a basis for the painting, which was completed in the last ten years of his life. 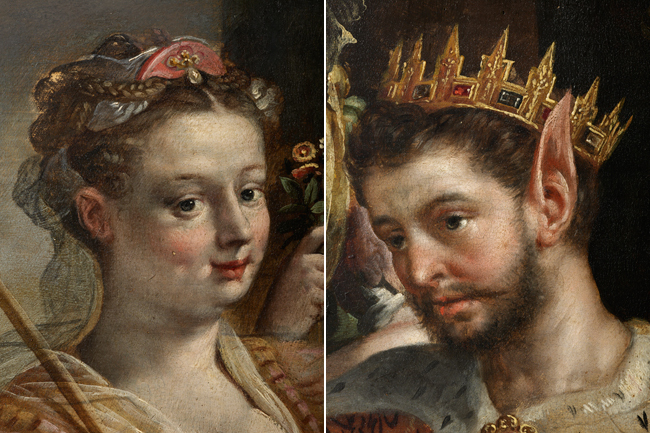 De Vos painted The Calumny on a wooden panel, which is between 0.5 and 1.3 cm thick. On the back, a simple inscription is visible, which can probably be associated with Hans van Haecht, Antwerp-based panel maker. This is how the artisan made himself known. The work is made up of four wooden horizontal panels, the lower three of which have exactly the same dimensions and are attached in the same way. The difference with the upper, fourth panel is striking. The front shows it may have been finished by another artist. In this section, this Calumny of Apelles may have been enlarged at a later date. Who did De Vos paint this composition for? Was the work intended for a public building, such as a court, or did he paint it on behalf of a collector? Also, the meaning and underlying message are not entirely clear. Does the painting carry a veiled political or religious message? Many questions remain unanswered today. But the beautifully detailed painting is a feast for the eyes. 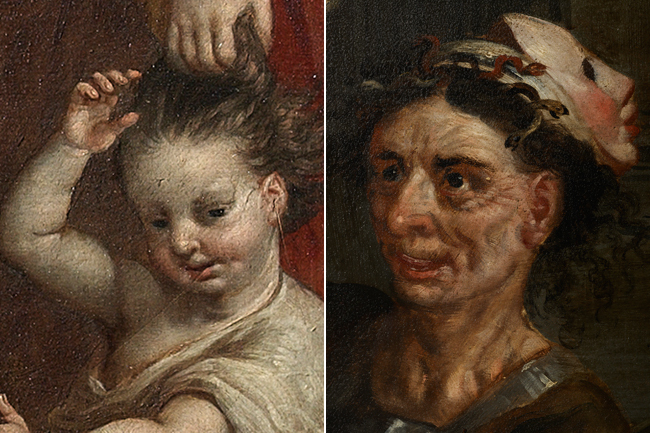 While the Rubens House may show this work to the general public for the first time in 2019, the work will be on display at the refurbished Museum of Fine Arts in Antwerp as a long-term loan. Based on Maja Neerman’s Master’s thesis, De calomnie van Apelles. Een herontdekt schilderij van Maarten de Vos, Vrije Universiteit Brussel, academic year 2014-2015.